How much does content actually cost? What we know: Content marketing is claiming a sizeable chunk of B2B marketing budgets overall. 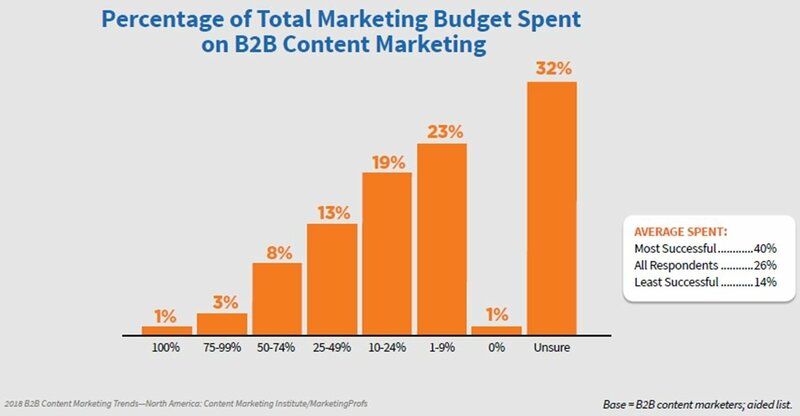 In fact, the CMI/MarketingProfs B2B content marketing study showed that B2B companies with the most success in content marketing are dedicating almost half of their total marketing budget to content marketing tactics. That number is a great start, but still leaves much to be desired. In a piece for Marketing Land, content marketing strategist and researcher Rebecca Lieb points out these sorts of figures only tell a small part of the story. But just because there’s not a straightforward answer, doesn’t mean there’s no solution at all. There are just some other questions that need to be answered first. I’m going to talk about three things you should consider while you’re budgeting for content and how to find a solution that works for you and your budget, whatever that may be. Before you take any action regarding your marketing program — whether that’s using a new channel or experimenting with a new medium — look at your overarching marketing goals. It’s like going out to lunch. Let’s say your options are a cool, modern pub that just opened up nearby or a little Brazilian place around the corner. Both have similarly priced menus and a good beer selection. Are you craving one type of food over another? Do you have any dietary restrictions? Are you meeting a large group of people? Is this for a business meeting? Answering these questions beforehand will ultimately lead you to the right decision. The same is true for content marketing. Let’s say your most important goal is to generate higher quality leads. You have enough marketing dollars to either invest in a social media management platform or develop a few gated resources like an eBook or small research report. Both of those tactics are certainly worthy investments, but growing a library of gated resources is a more practical solution for generating better leads. All these goals come with a different set of tactics and those might have different costs. 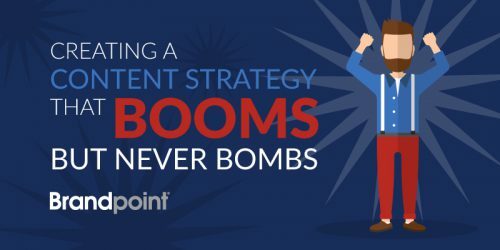 If you’re hoping to generate better leads and drive more conversions, you might look to invest in heavier, gated pieces of content like eBooks or whitepapers. If you hope to show off your brand’s personality, social media content and management might be more up your alley. If you’re trying to reach a new audience, social promotion might be the ticket. PRO-TIP: Don’t try to achieve all of those goals at the same time. Instead, pick one or two high-value goals and focus your content creation and marketing resources toward them. It will help you stay focused and prevent you from spreading your team and your budget too thin. It will give you the opportunity to see how your existing resources line up with the goals you just laid out and identify where they can be refocused. It lets you quickly identify any gaps in your current capabilities. If your content marketing goals suggest creating gated content pieces and infographics but you only have a blog writer and social media manager, it might be time to find someone who can write long-form content and develop the necessary graphic design assets. If you find more blog content will help your business grow, but you only have the capacity to produce a few blogs a month, it might be time to get some writing support to help you scale. In either case, look at your content marketing needs as a whole, not just as they relate to individual assets. You might need more blogs for your website, and freelancers might be able to write them for you. 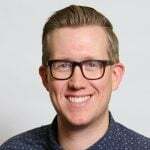 But scaling any part of your content marketing practice (especially one that receives your precious marketing dollars) requires a very strategic approach, and a freelancer might not be able to give you that kind of guidance. Especially if you’re in a niche or complicated industry, a good content marketing partner will work to understand your organization, audience and your industry before typing a single word of content. Even after you weigh all the things above, sometimes it still comes back to your budget. Perhaps we’re a little biased, but content marketing is a worthwhile investment. It can have a tremendous impact on organic search traffic, content engagement and your lead-generation practice. But it never makes sense to spend more than you have. You might not like the idea of trusting your blog creation to a freelancer, but if you only have $100 to spend on content right now and that’s where your dollars will be most useful, it might be your best bet. Likewise, you might identify a need to redo your website. But if you don’t have the $20,000 to do it, you might be better off spending some time and resources improving your existing content and conducting a technical SEO audit. There are also countless ways to get your existing content in front of new people. Paid media tactics like native advertising, Google AdWords or content distribution can be a terrific way to significantly boost some key metrics without investing $50,000 a year for a new content marketing professional. A good content marketing partner will make recommendations based on what will help you achieve maximum impact with whatever budget you have to work with. The tough part of this whole equation is that the old “you get what you pay for” model doesn’t necessarily apply. You could spend a lot of money on high-quality content. But if it doesn’t satisfy your core objectives, it will be a wasted effort. Conversely, spending a little bit of money on promoting existing content might be a lever for tremendous success for your organization. Spending more money won’t always translate into closing more sales. But, as the old saying goes, if it’s worth doing, it’s worth doing right. Once you identify your key marketing goals, take stock of your own internal resources and identify a budget, the question, “How much should I pay for content?” will become a whole lot easier to answer.